Both my daughter and I are crazy about these beets, which I've adapted from a Mark Bittman recipe. A perfect meal for one: A mixed green salad tossed with vinaigrette and pickled beets, a tiny wedge of delicious cheese, the end of a baguette, a few piquant olives, and a glass of rosé. Peel the beets. Cut them in half, then slice them into ½-inch wedges. Steam the beets in a steamer over boiling water, covered, until just tender; this could take anywhere from 15 to 25 minutes. Check on the beets several times, sticking a fork into one of the wedges, to see if it's tender. 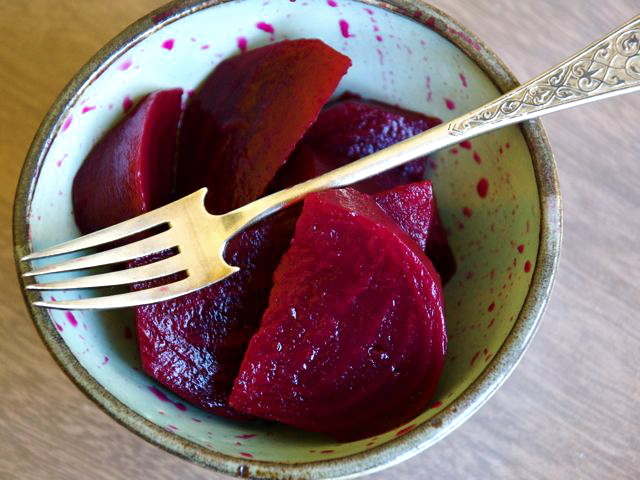 Once cooked, remove the beets from the heat and drain. In the same pot, mix together the vinegar, sugar, salt, and spices. Bring to a boil, add the beets, and cook for a couple of minutes. Cool, then spoon the beets into a quart jar and cover with the cooking liquid.